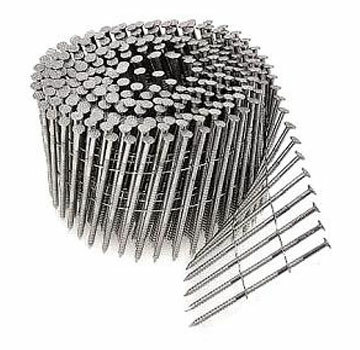 PRODUCT: 1-1/2" x .093" Coil Siding Nail, Ring Shank, 304 Stainless Steel, 15 degree Wire Collated, Full Round Head, 300/coil, 12 coils/box. 3600 Nails/box. Price/Box. APPLICATIONS: Shingles, Wall Shingles, Siding, Underlayments, Fence, etc. ***On older models of Hitachi NV65AH, the feed paw design is problematic for both the 1-1/4" and 1-/2" coil siding nails. Users can rectify the problem by slightly grinding down the top nub (of the three) on the feed paw to provide more clearance. This does not affect the performance of the tool and makes it friendlier to different brands of nails.